I was recently looking through various piano auction listings and came across a Dolceola. The name rang a bell, but for the life of me I couldn’t remember much about this instrument. After a little research, I uncovered more information. It’s an interesting device – so I thought I’d do a short piece here (for those who might be interested). 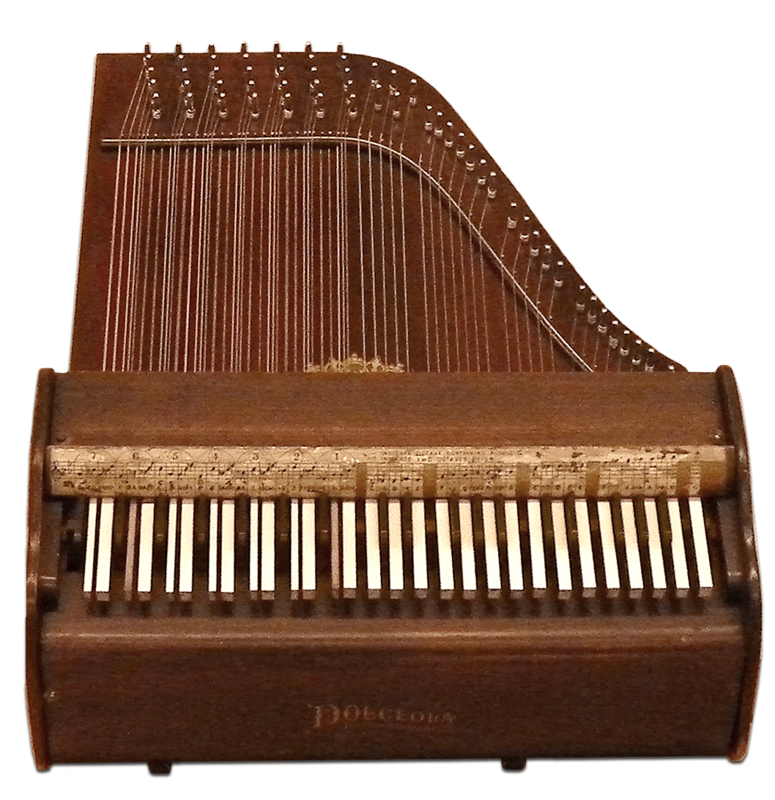 The Dolceola is a small keyboard instrument, that looks rather like an antique toy, but as you can see, and hear, from the video below, it is a proper keyboard instrument with an enchanting sound. I suppose the best way to describe the Dolceola is as a fretless zither played using piano-like keys. However, the action is such that this instrument was originally advertised as a “miniature grand piano”. If you look at the above image you can see a set of strings running perpendicular to the keyboard and strung over a soundbox. The bottom 7 sets of keys are used to produce chords of up to five notes. The top 25 keys (2 chromatic octaves) are for the melody. This arrangement is akin to a 7/25 chord-zither. But it is the Dolceola’s action that qualifies it for a place in piano history. For a small, inexpensive instrument the action offers a remarkable degree of control. I’ve reproduced a simplified diagram here (based on the 1903 patent), that shows how the action works. Like a piano the hammer strikes the string with a force proportional to that that the key is struck. The hammer strikes the string and bounces back up and is caught by the jack (doubling as a back check). The vibrating string is only damped when the key is released. But if the sustain lever is actuated, the string will continue to vibrate even when the key is released. It’s a remarkably clever and simple action – and it works. The Dolceola was invented by brothers David and Leander Boyd in 1903. David was a piano tuner and Leander ran a piano store (L.F. Boyd and Co.,) in downtown Toledo Ohio. The two brothers, under the auspices of their new Toledo Symphony Company, produced perhaps as many as 5000 Dolceolas between 1903 to 1907. David Boyd spent much of this period touring around the country with his wife selling these new instruments for around 25 dollars apiece. After his death production ceased. It would seem there are now only 100 or so still around. 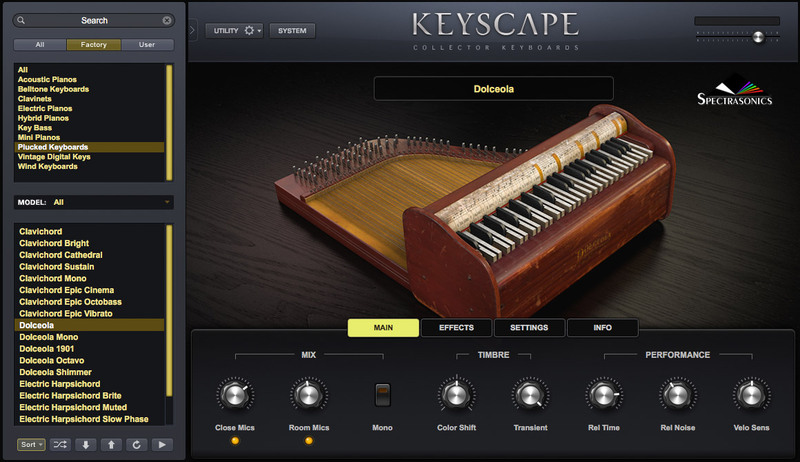 Spectrasonics, a software based virtual instrument design company, include the Dolceola in their 2016 Keyscape™ package. More information about the Dolceola can be found here. All About Piano! Be Prepared!